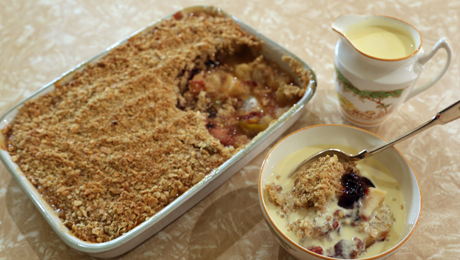 A taste of home, this sweet crumble will leave you wanting more! In a large roasting tin ¾ fill with a mix of seasonal fruit using a bigger quantity of cooking apples to the other fruits. We suggested using pears, greengages, damsons or any in-season fruit that you like. Sprinkle with dark brown sugar to taste, also juice of a lemon and a few knobs of butter. Cook in oven until fruit is just tender. Cooking time and temperature depend on the size of the dish you use. But if you're using a normal sized roasting tin then bake at 190/200 for about 20 mins. Let it cool completely. Make your crumble into whatever size you want. Bake until golden serve with homemade custard or whipped cream (or both).